Nouveau Plan de Paris Divise en 20 Arrondissements. 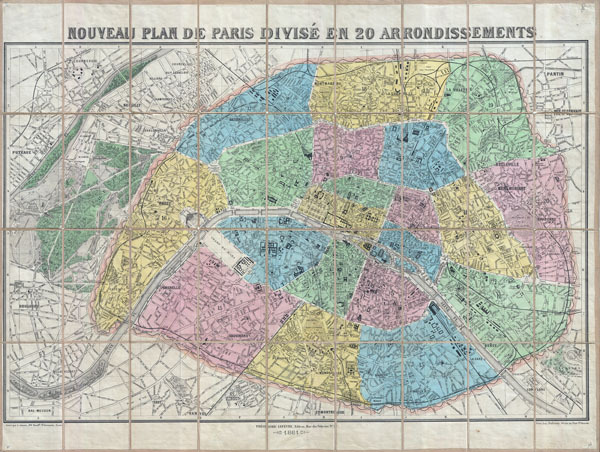 An extremely attractive 1881 decorative pocket map of Paris in 20 arrondissements by the French publisher Theodore Lefevre. Covers the old walled city of Paris and surrounding areas including the Bois de Boulogne. Geared toward the tourist market, this map notes all streets, parks, railways, and numerous important buildings and monuments. Hand colored in an attractive range of pastels. Theodore Lefevre (fl. c. 1875 - c. 1910) was a Paris based publisher active in the later part of the 19th century. Lefevre published a wide variety of material from text books to fashion literature to maps. Little else is known about this elusive French publisher. Very good condition. Original linen backing worn in some places, but map is otherwise clean.